Catchall / wildcard email addresses, e.g. <anything>@yourdomain.com isn’t really a great way to deal with email as it means the email server is more prone to spam and high workloads. As such, Microsoft do not support catch-alls on hosted Exchange or Office 365 and indeed their responses to questions are – “No – you cannot set up a catchall email address”, and in truth it isn’t best practice. There may be a legitimate need for a catch all, for me for instance, I use unique email addresses for each company – like amazon@mydomain.com or Microsoft@mydomain.com – so I have hundreds of addresses I want to receive and just don’t know what they all are. This only works on Office 365 Medium business and Enterprise plans and the new “Business” rane. It will NOT work on the Small Business plan as that does not support transport rules. It is easy to implement, and easy to disable later. The theory is simple – tell Office 365 it is not authoritative for your domain, so it thinks mailboxes exist on other systems. 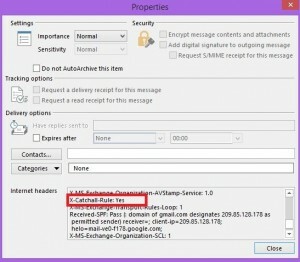 In this way, Office 365 will accept all emails, and if the mailbox does not exist it will forward it (via MX or transport rule) to the next system where the mailbox resides. 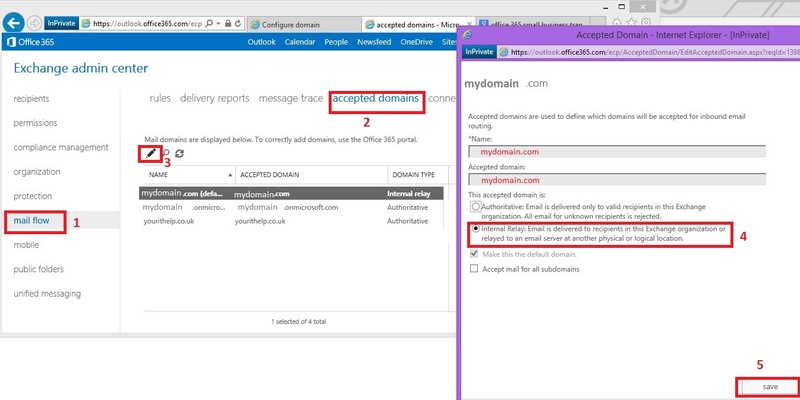 But, we implement a rule which intercepts the emails before they are sent on, and forwards it to a known email address on office 365. Simple! But be careful to do it correctly. I have tested this on my own Office 365 system – your system may differ or have different settings that prevent this working. So test, test and test again and I hope this article helps but it does not guarantee it will for you! Ignore any warning about needing to set up transport rules. You also need to create a group (e.g. “All”) that directly contains all mailboxes and groups which you do NOT want diverted. Add users/groups individually to this group (do not nest groups). This group MUST contain the catch-all mailbox or catch-all group. Wait a couple of minutes for rule to apply, and then test. 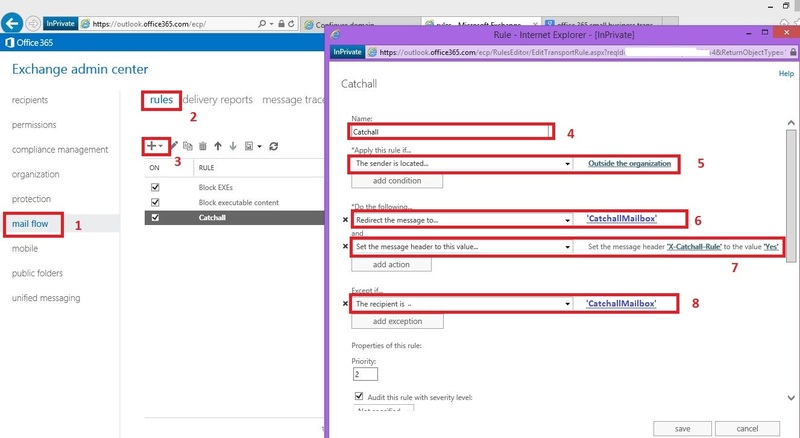 Send email to <anyrandomaddress@mydomain.com> and it should be delivered to the catch-all email address you specified. If you look at the header of the delivered email, (and you did optional step 7 above), you can see it was the rule that was responsible. That’s it – I’ve not found any downsides to this, so bemused why Microsoft say it is not available functionality…. Apart from the extra email load on their servers of course! Update : Thanks to Katie for highlighting a mistake in this document which I hope is now updated – thanks! We implemented the solution you suggested in the following article here and I found it to cause a routing issue with forwarding external calendar invites to internal or external users. Honestly, I am not well read into how the underlying forwarding mechanism works for calendar invites on Exchange. I suspect that it retains the sender properties of the original invite when the message is forward causing it to trip the catch-all rule. We worked around it by adding an exception for email type “calendaring,” which is less than perfect since it allows any calendar invite to slip through the rule (now a catch-most-things instead of a catch-all!). If I am completely off-base here, please just let me know, however I wanted to pass along the info in case you ever run into something similar. Thank you for posting the article, it really helped me out!